OBX Axe Throwing is your OBX indoor activity, a social sport that anyone can play (and win). Because OBX Axe Throwing is the best OBX indoor activity on the Outer Banks. Points are scored by throwing axes at a giant dartboard-like target. Therefore, the closer you get to the bullseye, the more points you earn. Sounds simple enough? Right? Most Importantly, add the fact that these are REAL, SHARP, HEAVY-DUTY Axes, equals an adrenaline junkie’s dream! Our trained staff of Axe Coaches help groups learn how to nail a bullseye. No experience needed. Once you find your stride, our staff will teach you some games to heighten the competition and the fun! Do you have what it takes to be an Axe-pert? We are a B.Y.O.B/W establishment! Up to 3- per person or 1/2 bottle of wine. (No glass or Liquor PERMITTED) Because remember, we are here to have fun and furthmore WE ARE NOT A BAR! We have snacks available for purchase at our concessions area and you may even be able to catch a local Food Truck out front most nights! Grab yo wife, and grab yo kids, and get on over to OBX Axe throwing, you know you wanna! 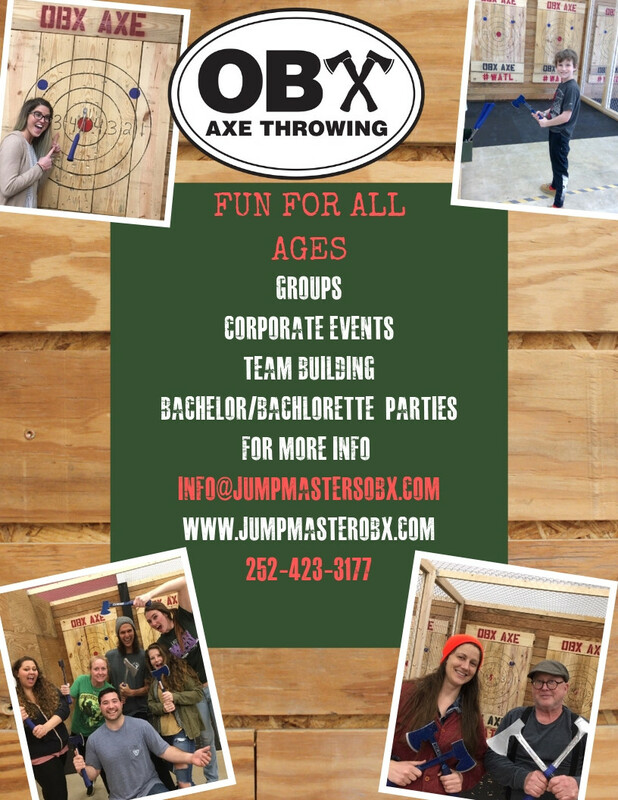 View more details about OBX Axe Throwing!